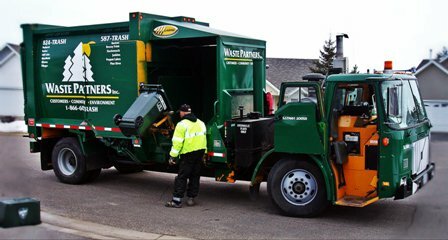 Waste Partners provides dependable, courteous and value priced collection services to residents in the cities of: Backus, Baxter, Brainerd, Breezy Point, Crosslake, East Gull Lake, Fifty Lakes, Hackensack, Jenkins, Lake Shore, Manhattan Beach, Merrifield, Nisswa, Pequot Lakes, Pillager and Pine River. We provide our customers with a residential cart on wheels in various sizes to fit your needs. This allows our drivers to provide a safe and more efficient service to our customers. Our cart sizes are 35 gallon, 65 gallon and 95 gallon. We also provide a prepaid orange bag service and a pay per bag drop off site at our facility in Pine River. We offer a yard waste pick up in the fall and the spring. Please call the office to inquire about pricing and the service for your area. Waste Partners Inc. has the equipment and the industry knowledge to provide the most dependable, cost-effective commercial collection services for your business in the Brainerd Lakes area. We offer volume based service using a variety of cart and dumpster sizes. Doing a little spring cleaning? Cleaning out the cabin? Waste Partners can help with our Temporary Container Services! We will deliver a dumpster to your site for your clean up project. Our dumpsters range in size from 2 to 8 yards.